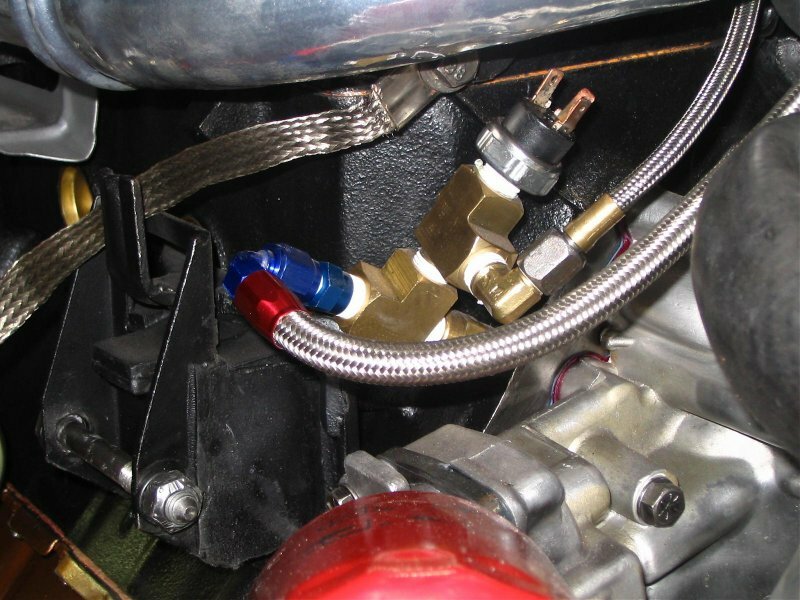 Below are a series of pictures provided by Just a Six (David) that show the location of the oil pressure sensor on the turbo Buick engine and the modification required to add a mechanical oil pressure gauge while retaining the original factory light which is driven by the sensor. Thanks David, your clean engine makes me want to have you come pull my engine! the pictures are outstanding. 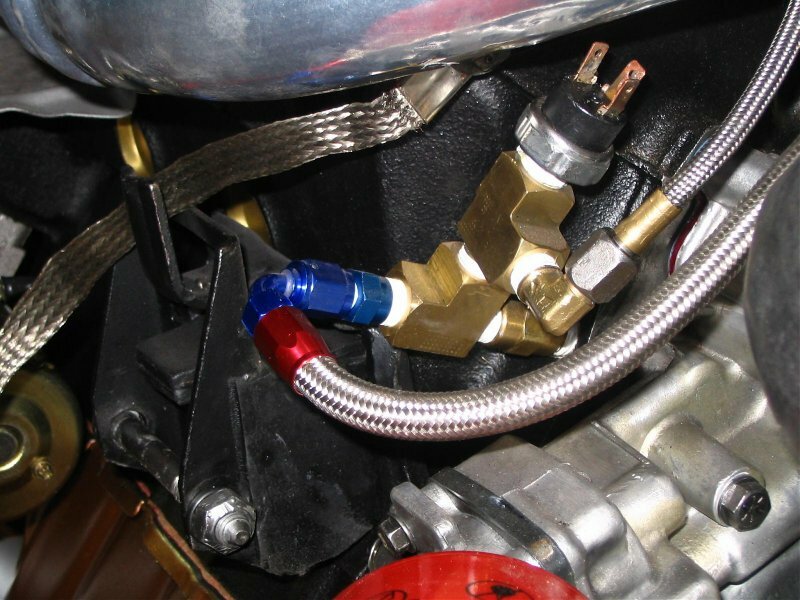 David used a metal braided hose to provide pressure to the oil pressure gauge that is mounted inside the car instead of the small nylon tubing that normally is provided with the gauges from the gauge manufacturer. 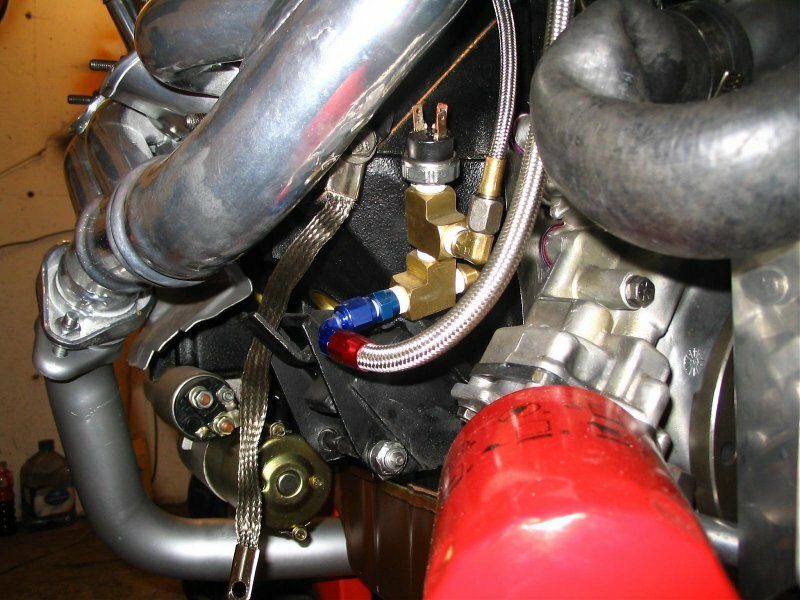 He also used a metal braided hose to replace the hard line oil supply tube that provides oil to the turbo. 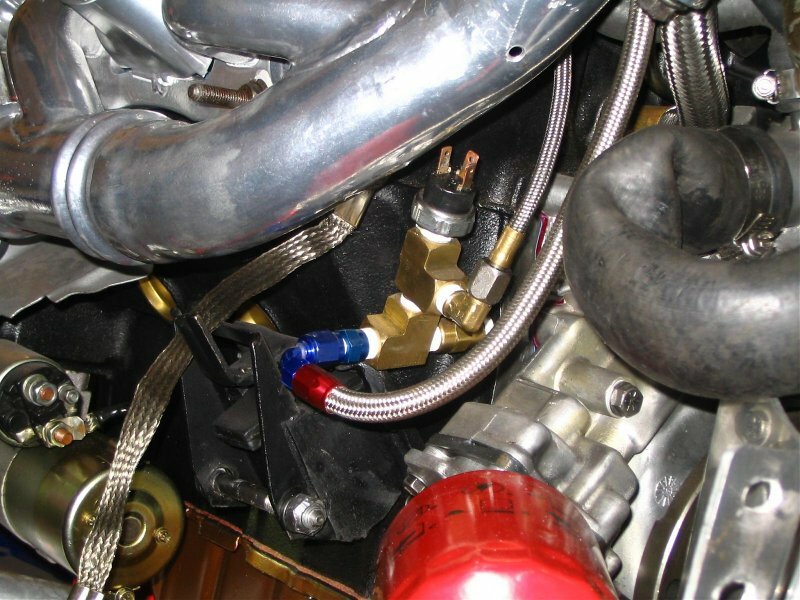 Do Not use a flexible turbo oil drain line. Those usually don't drain oil fast enough out of the engine and will cause oil to back up in the turbo which is not good. In order to retain the factory idiot light, he has added a second brass Tee block to the original set up so he can install the factory sender on one side and the supply line to the gauge on the other. Many simply remove the factory sender from the original fitting, and, attach the line from the gauge in the sender's original position. This makes the installation easier, but does eliminate the idiot light on the dash which is a nice back up feature to have. Even though I eliminated the factory sender on my cars, I believe it is worth the effort to add the extra brass Tees and have the best of both worlds. Now, there seems to be a lot of misconception about the oil pressure sender. It has two functions. One half of the sender triggers the idiot light in the dash. When oil pressure is less than approximately 4 psi, the contacts on this half are closed and voltage flows to the bulb in dash illuminating it. When the oil pressure rises to above 4 psi, the contacts open and the light goes out. If you are going wide open throttle and the light comes on, it is probably way too late to save the engine. But, if you are cruising down the road and the light comes on because the engine is low on oil and the pump is sucking air, or something in the pump just broke--you may have time to shut it down before ruining the crank. Not a bad feature to have as most of us don't stare at the gauge all the time, but, a light will get our attention. It happened to me once when the factory oil cooler line started leaking at the crimped fitting and pumped most of the oil out of the engine. The other half of the sender works in just the opposite manner. When the pressure rises to 4 psi, the contacts in the sender close so that voltage will now pass through the sender. This side of the sender serves as a back up to the fuel pump relay. If the fuel pump relay goes bad, then when the engine has been cranked long enough to build oil pressure above 4 psi, then voltage will flow thru the sender to the fuel pump and the car will then start and run normally. This is another darned good reason to retain the factory sender. It might prevent you from having to hot wire the pump in the dark some night. Note to me, buy a brass Tee and put the factory sending circuits on the car. Let's dismiss one bit of folk lore that never seems to go away. Neither the factory sender, nor anything else originally on the car, will shut the engine down if the oil pressure drops to less than 4 psi. Nope, No How, No Way! It was not designed to do so. The circuit is simple and was intended for two things. Light the Choke/Volt light in the dash, and provide a back up in case the fuel pump relay dies. I normally use teflon liquid sealer on pipe joints because I have seen too many teflon tape bits get into the system and plug things up. It works well as long as one is very careful to keep it where it is supposed to be. I just like the liquid sealer better. One final note-the factory wiring harness to the oil pressure sender is not shown in this picture. It is very common, particularly when the sender has been removed, for the harness to rub and short out. When this happens, either the fp/inj fuse, or the gages fuse may blow. If the fp/inj fuse pops, the car is not going to run. Keep that in mind and know where to look for a problem.